Sol-Gel Science: The Physics and Chemistry of Sol-Gel Processing presents the physical and chemical principles of the sol-gel process. 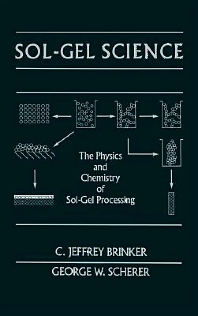 The book emphasizes the science behind sol-gel processing with a chapter devoted to applications. The first chapter introduces basic terminology, provides a brief historical sketch, and identifies some excellent texts for background reading. Chapters 2 and 3 discuss the mechanisms of hydrolysis and condensation for nonsilicate and silicate systems. Chapter 4 deals with stabilization and gelation of sols. Chapter 5 reviews theories of gelation and examines the predicted and observed changes in the properties of a sol in the vicinity of the gel point. Chapter 6 describes the changes in structure and properties that occur during aging of a gel in its pore liquor (or some other liquid). The discussion of drying is divided into two parts, with the theory concentrated in Chapter 7 and the phenomenology in Chapter 8. The structure of dried gels is explored in Chapter 9. Chapter 10 shows the possibility of using the gel as a substrate for chemical reactions or of modifying the bulk composition of the resulting ceramic by performing a surface reaction (such as nitridation) on the gel. Chapter 11 reviews the theory and practice of sintering, describing the mechanisms that govern densification of amorphous and crystalline materials, and showing the advantages of avoiding crystallization before sintering is complete. The properties of gel-derived and conventional ceramics are discussed in Chapter 12. The preparation of films is such an important aspect of sol-gel technology that the fundamentals of film formation are treated at length in Chapter 13. Films and other applications are briefly reviewed in Chapter 14. Materials scientists and researchers in the field of sol-gel processing will find the book invaluable. Graduate students and practitioners involved with sol-gel processing. Preface. Acknowledgments. Introduction. Hydrolysis and Condensation I: Nonsilicates. Hydrolysis and Condensation II: Silicates. Particulate Sols and Gels. Gelation. Aging of Gels. Theory of Deformation and Flow in Gels. Drying. Structural Evolution during Consolidation. Surface Chemistry and Chemical Modification. Sintering. Comparison of Gel-Derived and Conventional Ceramics. Film Formation. Applications. Index. C. Jeffrey Brinker is widely recognized for his pioneering work in sol-gel chemistry – the formation of ceramic materials from molecular precursors. His initial efforts addressed the processing of highly refractory glasses like fused silica at remarkably low temperatures – less than half that of conventional melt-processing. He then turned his attention to the preparation of porous materials useful for a wide range of applications including antireflective coatings, sensors, membranes, adsorbents, and thermal and acoustic insulation. Through exploitation of the scaling relationships of mass and size of fractal objects, he devised a fractal engineering approach to tailor the porosity and pore size of these materials. This early work culminated in the publication of Sol-Gel Science in 1990 (with co-author George Scherer), a book that remains the most highly cited reference in this rapidly growing field. From 1974 to 1985, Professor George W. Scherer was at Corning Glass Works, where his research included optical fiber fabrication, viscous sintering, and viscoelastic stress analysis. The latter work was the subject of his first book, Relaxation in Glass and Composites (Wiley, 1986). From 1985 through 1995, he was a member of the Central Research Department of the DuPont Company, where his work dealt principally with sol-gel processing, and especially with drying. In collaboration with Jeff Brinker of Sandia National Labs, he wrote a book entitled Sol-Gel Science (Academic Press, 1990). He is a fellow of the American Ceramic Society and a member of the Materials Research Society, the American Society of Civil Engineers, the American Concrete Institute, and RILEM. In 1997 he was elected to the National Academy of Engineering. In February, 1996, he became a full professor in the Department of Civil & Environmental Engineering at Princeton University, and a member of the Princeton Materials Institute (now, PRISM). His research involves mechanisms of deterioration of concrete and stone, particularly by crystallization of ice and salts in the pores. Excellent source of scientific in-depth understanding of gelling process and the nature of gel structure.